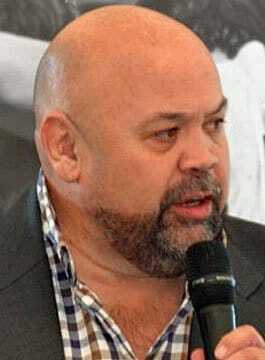 Gareth Chilcott is a former Bath and England Rugby Player, Pundit and After-Dinner Speaker. Gareth, more popularly known as “Cooch” was born and raised in Bristol. His introduction to rugby came when he was 11 years of age, playing rugby at Ashton Park Secondary School. He joined Bristol’s Old Redcliffians junior team for whom he played for 3 years . His rugby talent was spotted and in 1976 he joined Bath RFC. Together with players of the calibre of Jon Hall, Stuart Barnes, Andy Robinson and Jeremy Guscott, Cooch helped make Bath the dominant force in English rugby in the 1980s. Gareth Chilcott’s International debut was on Saturday, 3rd November 1984 against Australia at Twickenham where England lost 19-3. In 1987, Gareth Chilcott earned notoriety by being one of a group of players to be suspended following a brawl with Wales in Cardiff, apparently incited by Bath teammate Hill. For a time thereafter he was labelled as being a ‘dirty player’, an unfair slur on someone who held all the game’s best traditions and values close to his heart. Despite his Cardiff disgrace, Gareth was selected for the 1987 World Cup and played in three matches. Chilcott also toured with the British Lions in 1989 to Australia. With his famous headband and trademark moustache, Gareth Chilcott will always be remembered as one of the game’s true characters. As a popular rugby after-dinner speaker, his extremely funny rugby anecdotes and stories have been enjoyed at private and corporate events all around the world. Gareth Chilcott is recognised as one of the UK’s most entertaining rugby speakers.